CANADIAN DEFENCE MATTERS: CANADA AND NATO, HOW FAR IS CANADA PREPARED TO GO? A battlegroup in modern military theory is the basic building block of an army's fighting force. A battlegroup is formed around an infantry battalion or armoured regiment, which is usually commanded by a lieutenant colonel. The battalion also provides the command and staff element of a battlegroup, which is complemented with an appropriate mix of armour, infantry and support personnel and weaponry, relevant to the task it is expected to perform. According to Wikipedia a Commonwealth battle group is usually named after its major constituent; for example, the Canadian Army's "1st Battalion, The Royal Canadian Regiment Battle Group" (shortened to "1 RCR Battle Group") on an operational tour of duty in Afghanistan in 2007–08. It would require the army to rotate one of its infantry battalions and a headquarters into the position once every six months, dependents would not be stationed “in country” as was the case in the past with our decade’s long deployment of Fourth Brigade to Germany. The Canadian Army currently uses a 36 month training cycle in which one of three brigades is at full strength and completely available for one year while the other two are in earlier stages of training. It is not clear if the battle group for NATO would come from the ‘duty’ brigade, thereby lessening its ability to “generate, employ and sustain combat ready combined arms forces to conduct operations at home and abroad” or if it would come from a unit at a different stage of readiness. It would also be easy to get caught up in the question of just what equipment our troops would be equipped with. One assumes that it would be a LAV equipped infantry battalion, perhaps with a squadron of TAPV’s for reconnaissance. An interested onlooker would not find it difficult to think about just what else such a force would need to have to be militarily viable. 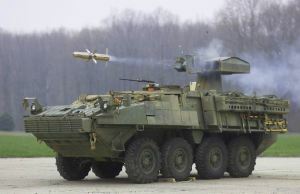 Items such as increase anti-tank defences, TOW under armour for example, fire support in the form of 81mm mortars carried in LAVs or TAPVs, short range anti-aircraft weapons similarly mounted and some kind of short to medium range reconnaissance drone such Scan Eagle are obvious choices. The same onlooker might also wonder if our procurement system is agile enough acquire any of those items not now in the system in a reasonable length of time. Questions about rotation schedules and equipment, however, miss a far more important issue. What is the military rational of this force, particularly the Canadian contingent? It has been pointed out that the deployment goes contrary to the NATO-Russia Founding Act signed in 1997 where the military alliance explicitly agreed not to station troops along the Russian border in former satellite states. But NATO officials now argue Russia effectively tore up the treaty with the annexation of Crimea and that it has a duty to defend new members, including the Baltic states, Poland and Romania. If the plan is to signal Moscow, in a way that does not threaten them, that we will support our new NATO military allies and that an attack on them is an attack on the alliance at large, then how do we make that message credible. If our forces are not there simply to act as ‘speed bumps” for passing Russian armoured forces then there must be a plan to reinforce or extract them in the event deterrence fails and major hostilities occur. They must be equipped with the systems necessary to provide, at the very least, for their own survival until such actions can be taken. Canada must answer the question for itself, before Moscow asks it for us, how far we are prepared to go to defend our Eastern European allies and what measures are we willing to put in place to deal with the responsibility of putting one thousand Canadian soldiers in harms way?